From the producers of The History Channel’s “Full Metal Jousting,” come the Knights of Valour – the most extreme sport of jousting live. Presented by Vaughan's RV, each pass of rider and horse is excitement exploding before your eyes. 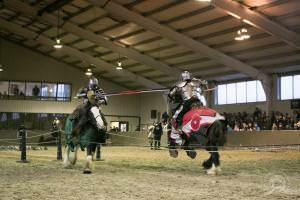 It is truly full-contact jousting – there’s no scripts, choreography or airbags. Choose your favorite knight and cheer them on to victory!